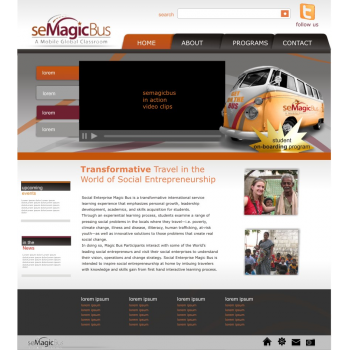 seMagicBus - intensive hands-on educational program in real-life “social entrepreneurship". 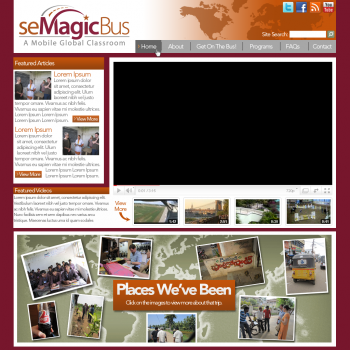 Classroom is in the field; lectures are delivered “on the bus” between field-based application exercises. 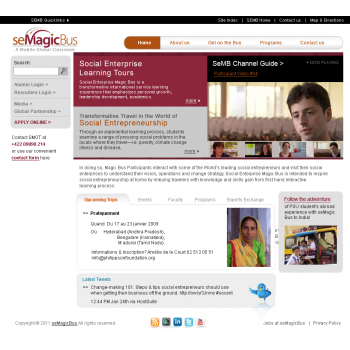 Topic is unique and timely: "Social entrepreneurship”- the practice of using business and innovation strategies to solve social problems and create social change. 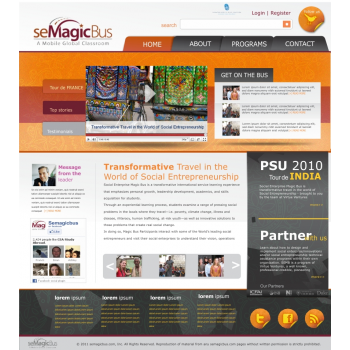 seMagicBus is an abroad course rooted in dynamic and applicable experience studying and interacting with social enterprises. 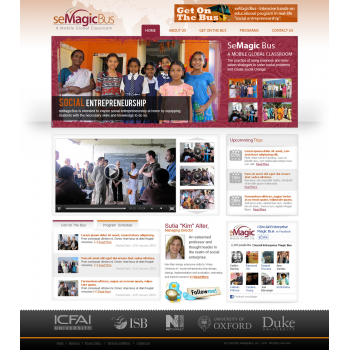 Participants will be able to see first-hand the practice of using business and innovation strategies to solve social problems. 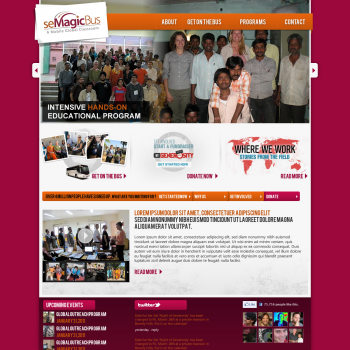 This unique program turns the field into a classroom, while academic fare/theoretical frameworks are delivered “on the bus” in between field-based research and application exercises. 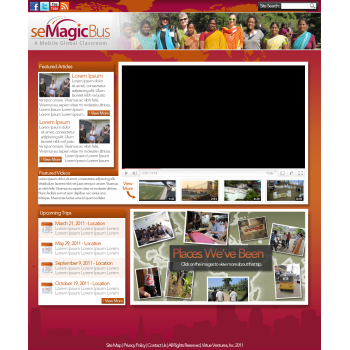 Through a hands-on interactive learning process, seMagicBus participants examine a range of pressing social problems where they travel—i.e. poverty, climate change, disease, illiteracy, homelessness, HIV, trafficking,—as well as explore “entrepreneurial” solutions to these problems that create real social change. 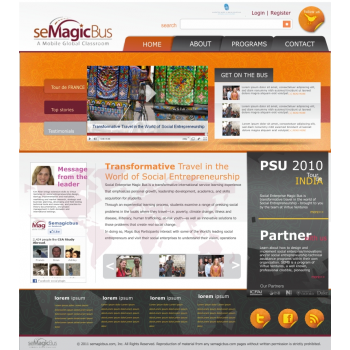 seMagicBus participants interact with some of the world's leading social entrepreneurs and visit their enterprises to understand their vision, operations and change strategy. 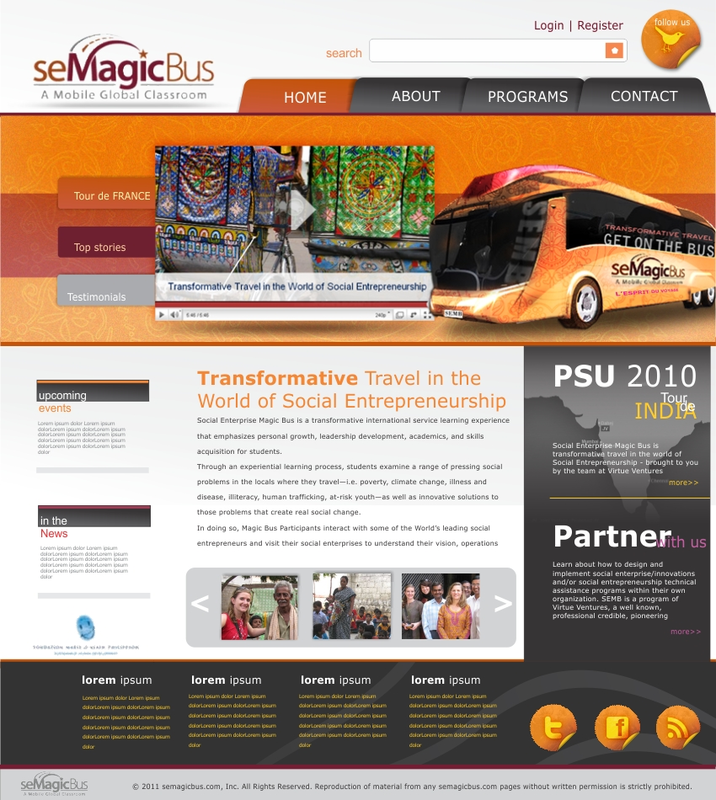 seMagicBus is intended to inspire social entrepreneurship at home by equipping students with the necessary skills and knowledge to do so. 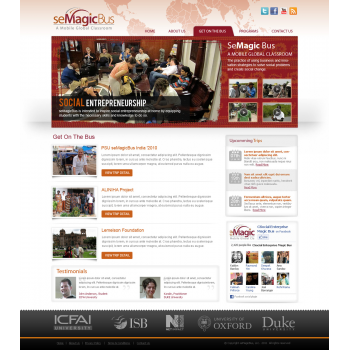 SEMB's has two primary target audiences: 1) graduate and undergraduate college students interested in social/sustainable business, economic development and local/global social causes. In conjunction with students, SEMB targets universities internationally as partners for abroad programming. 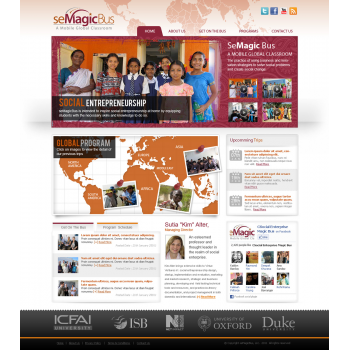 2) The second primary market is practitioners working for nonprofits, social sector and economic development organizations and/or individuals interested in launching social enterprises/innovations or social entrepreneurship support programs. 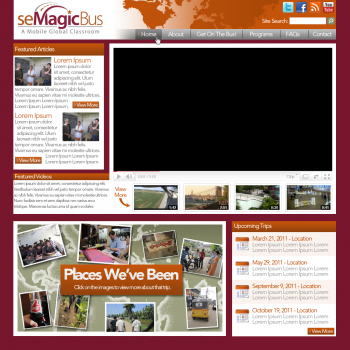 1) The landing page will feature a promotional video of seMagicBus, upcoming trips, and our social network pages (Twitter & FB). The look should be sharp, organized and vibrant. 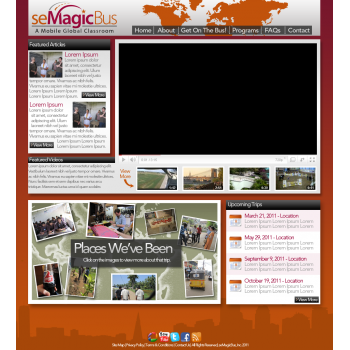 The seMagicBus pictures should be creatively incorporated with icons, main featured photographs, tabs, banners etc. 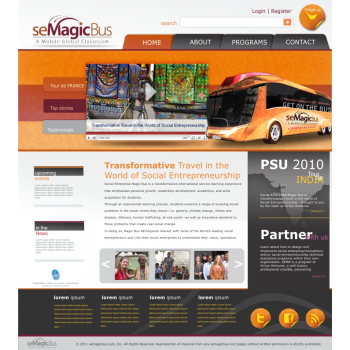 2) "About" page that will explain what seMagicBus is, who its leaders are and what social enterprise is briefly. 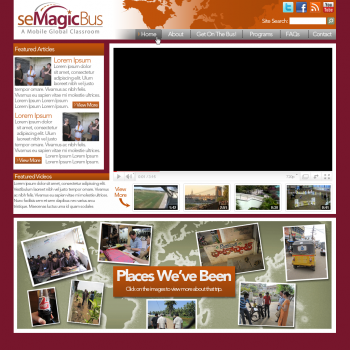 3) "Get On The Bus page highlighting past trips and student, practitioner and faculty testimonials. 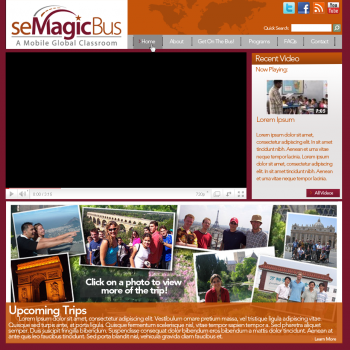 4) "Programs" which will carry downloadable brochures for upcoming trips, trip pricing, an example schedule of abroad trip as well as a place FOR universities that will invite universities and their staff to create an abroad program specific to their student community. 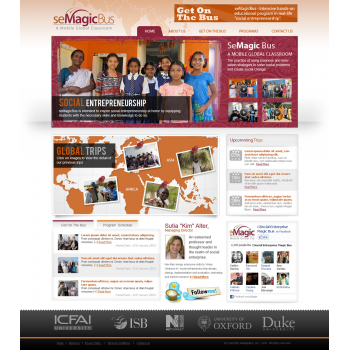 We will include our partner universities (PSU, Icfai Univ, Indian School of Business: Net Impact, Oxford, Duke) and the credentials of our Managing Director, Kim Alter, an esteemed professor and thought leader in the realm of social enterprise. 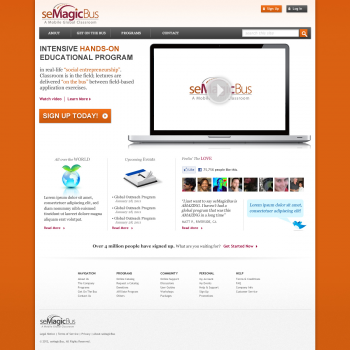 5) "Contact" page incorporating an email field and phone numbers for seMagicBus. 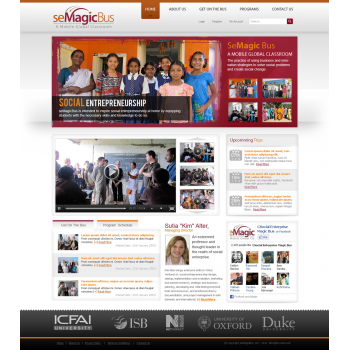 Universities: It's important that universities that potentially want a structure an accredited abroad program with seMagicBus see the academic value of seMagicBus as it is lead by an Oxford professor and is the only program of its kind that offers on-the-ground experience in the field of social enterprise and a first-hand perspective of social entrepreneurial application. Students: value of SEMB course is higher value than standard classroom course in terms of gaining real world skills and knowledge, achieving personal growth, living cases to problem solve and apply academic frameworks, textured experience of culture and place, having an once-in-a lifetime experience and FUN. 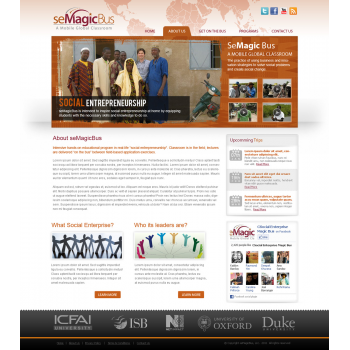 Practitioners: rare and high quality opportunity to learn about how to design and implement social enterprise/innovations and/or social entrepreneurship technical assistance programs within their own organization. 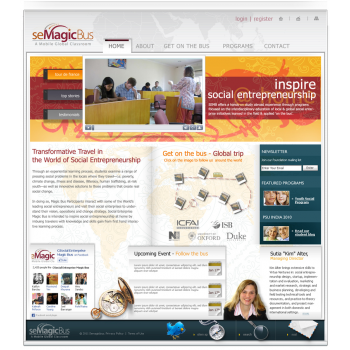 SEMB is a program of Virtue Ventures, a well known, professional credible, pioneering technical assistance organizations for social enterprise. 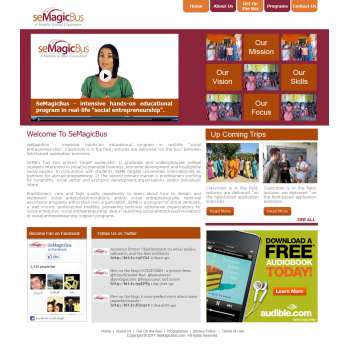 The look and feel of the website should be vibrant, simple, attractive/enticing and well organized. 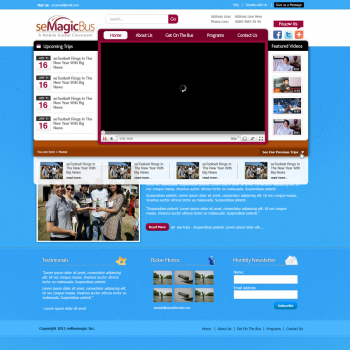 Feel free to exercise creativity with tab text, picture usage, organization etc. 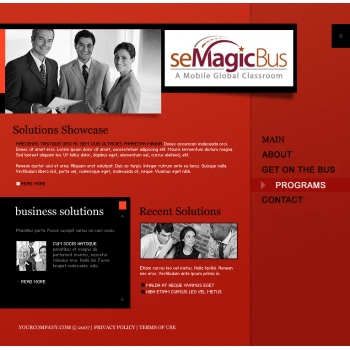 It should incorporate the seMagicBus logo.